La Fee Bohemian Absinth is a premium distilled spirit that is a modern Absinth originally created in Bohemia following the velvet revolution, with subtle herbal undertones of fennel, mint and rather less aniseed than that absinthe produced in France at the end of the 19th Century. Bohemian tastes have always meant that less anise is used in the drink's production, and explains why Bohemian Absinth does not turn milky ('louche') when water is added. 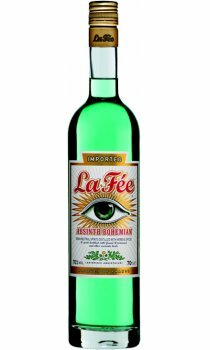 Whereas the heavy aniseed flavour of La Fee Parisian Absinthe is often not suitable for use in cocktails, La Fee Bohemian Absinth has a refined subtlety, whose distinctive flavour is a mixologists dream.